Cardiovascular disease is the leading cause of death worldwide. In this context, the overall prevalence of at least moderate heart valve disease is estimated to be 2.5% before the age of 65 years and up to 13% after 75 years. Among these patients, mitral valve disease accounts for almost half of the cases, being the most common in younger adults. The gold standard treatment for mitral valve regurgitation is mitral valve repair, particularly in young patients with mitral valve prolapse. Mitral valve repair, as opposed to mitral valve replacement, offers better outcomes with significantly decreased perioperative complications. Unfortunately, mitral valve replacement still remains common, even though the technical feasibility of mitral valve repair has been proven1. The average repair rate in patients with degenerative mitral valve disease is around 60% worldwide, way below the at least 90% threshold recommended by the American College of Cardiology2 or the European Society of Cardiology3. Since its founding in 2009, the Mitral Foundation has been a driving force in advancing the understanding of mitral valve disease and promoting mitral valve repair techniques. Our commitment to patient care, education, research, and academic excellence continues to accelerate in many new and exciting ways. Our work reaches across continents as we organize surgical missions to developing countries and lead mitral valve repair workshops around the globe, educating surgeons from over 50 countries. Achieving a transformational change also mandates tireless effort and tenacity, and our educational commitment to advocate for and endorse mitral valve repair among surgeons worldwide has never been stronger. 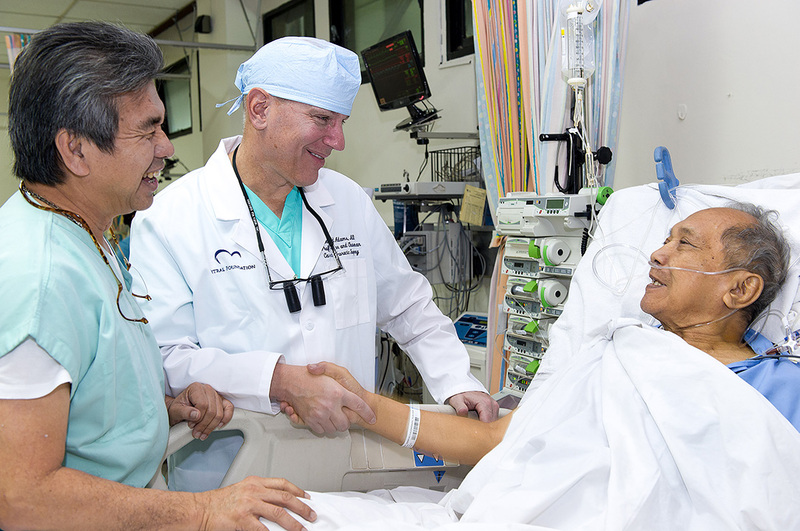 Our partnership with patients, families, researchers, clinicians and philanthropists throughout the surgical community will continue to provide support and information about mitral valve disease and mitral valve repair. Because of the generosity of our friends and donors, the Mitral Foundation will relentlessly persist on expanding and leading new programs and initiatives to maximize the impact of every gift. Thank you for being a part of our enduring mission. 1. Castillo JG, Anyanwu AC, El-Eshmawi A, Adams DH, All anterior and bileaflet mitral valve prolapses are repairable in the modern era of reconstructive surgery.Eur J Cardiothorac Surg (2014) 45 (1): 139-145. 2. Nishimura RA et al. 2017 AHA/ACC Focused Update of the 2014 AHA/ACC Guideline for the Management of Patients With Valvular Heart Disease, A Report of the American College of Cardiology/American Heart Association Task Force on Clinical Practice Guidelines. J Am Coll Cardiol 2017;Mar 15: Epub ahead of print.